Join like-minded women on a cycling adventure of a lifetime, taking on a 450km cycle challenge from Ho Chi Minh in Vietnam and finishing at the spectacular Angkor Wat in Cambodia. During the 10-day trip (unless you opt to extend your trip to include a holiday) and you will complete 6 days of cycling fully supported by local guides and crew. While in Cambodia you will spend the afternoon in the city of Phnom Penh meeting a group of women who have been supported by CARE’s work, which your fundraising will support. You will learn more about the charity's projects aimed at tackling sexual harassment and violence against women at work and meet inspiring women who are overcoming challenges based on their gender. By increasing your fundraising total to £3,375 (£3,395 with a private room) you can extend your trip for 24 hours and visit entrepreneurs who have received financial loans from our Lendwithcare initiative in Battambang. Your minimum fundraising will cover the cost of your flight, accommodation, meals, bike hire and at least 55% will support CARE’s work with women and girls around the world, who are most affected by poverty. Our 450km circular cycling challenge will begin in the metropolis of Ho Chi Minh in Vietnam. Having checked into the hotel you will be collected for a bike fitting and briefing, followed by a welcome dinner and overnight stay in the city. After breakfast we will ride for a couple of hours out of Ho Chi Minh City to Mytho – the gateway of the Mekong delta. Today’s biking will lead you right into the heart of the rural Mekong. After a ferry journey across the Tien River at Mytho we’ll wind our way past banana plantations, fields of sugar cane, through the lush green landscape of the delta, crossing rivers and canals by ferry. A final ferry across the gaping expanse of Co Chien River leads us to Travinh, a pretty tree-lined town with a large population of ethnic Khmer. Overnight stay in a hotel in Travinh. Breakfast will be followed by a short boat trip to Vinh Long, one of the famous fruit-producing provinces in Mekong. You’ll ride along country lanes, easy dirt tracks and trails. This is biking at its most glorious - through tiny orchards, taking in the full colour of Vietnamese riverside life. We'll pedal alongside picturesque delta homes, pause to chat with welcoming villagers, and clack across innumerable wooden bridges. Then we’ll cross narrow canals on a local wooden boat known as a sampan - a delightful way to observe this “heart of Mekong” area. Overnight in a local hotel in Can Tho. Today’s ride is split into two sections. After an early breakfast, you will take a boat trip to the famous Cairang floating market before continuing to Phong Dien. The route weaves through the morning market bustle along the banks of the busy river, allowing ample chance to view cottage industries, timber merchants, coconut shredders, and vibrant market stalls. You will continue by bike to the main road, which takes you along the highway back to Can Tho for lunch. In the afternoon, you will cycle along a minor road leading upstream towards Longxuyen. The ride ends with a final ferry crossing and short transfer to a hotel in Long Xuyen. After a short transfer to Tri Ton, we begin to encounter more undulating terrain and mountains come into view as you ride closer to Chaudoc. The presence of Thotnot trees indicates the growing proximity to Cambodia and the local people speak Vietnamese as their second language. This afternoon you will cycle to the killing fields of Vietnam at Bachuc, where Polpot’s regime massacred over 3,000 Vietnamese in 1978. Following this excursion you will ride along scenic country roads to the hotel in Chau Doc. Dinner and overnight stay in a hotel. Those with energy to spare can climb Sam Mountain for sunset! Today we wil take a break from cycling to cross the border into Cambodia by speedboat. The boat takes 4 and a half hours and then we will enjoy our first Cambodian lunch. A Cambodian visa is available at the border for US $35 per person. After lunch, we will visit a CARE project to see how your fundraising will help women and girls living in poverty. We will most likely meet women who have experienced violence and sexual harassment at work and home and find out how they're overcoming barriers of being a woman in a developing country. Today we will take a short transfer to escape the bustling city, and then start the Cambodian part of our ride. We will have said farewell to some of the crew in Vietnam and will be welcoming our new team who will be with us for the remainder of the trip. We will cycle 50km before lunch followed by a bus transfer to Siem Reap. The roads in Cambodia are more red in colour and you will be be cycling alongside school children, local farmers, and cattle. During this morning’s cycling we’ll tour the local villages, enjoy some welcome off-road cycling, and witness the many ways the local people use sugar palm trees. Afterwards, we’ll cycle to a local restaurant for lunch near our afternoon destination of Beng Mealea. An incredible sight to behold, Beng Mealea is a true hidden gem in the middle of the jungle with a unique character that sets it apart from the more visited temples of Angkor Wat. Having explored the temple we return to Siem Reap for an overnight stay. Today is a day of temple touring! You'll be able to visit one of the seven wonders of the world and ticket it off your bucket list! Th best way to tour the temples is via the secret jungle paths that weave around the ancient city. Our local guides know them like the back of their hands and will take us away from the busy tour busses. We will stop at all of the main temples and be told about the history of each by our guide while snaping many a photo of the embracing fig trees and gigantic creepers. We will finish the day with a celebration at the finish line of the ride and a celebratory dinner! Today is a free day when you can do as you please until we leave to catch a homeward flight from Siem Reap. You might want to visit Angkor Wat for sunrise or hit the markets and make the most of the great shopping opportunities! If you are extending your trip to include the visit to Lendwithcare entrepreneurs then you will have the morning free to explore Siem Reap before setting off after lunch on a 3-hour drive to Battambang. Hotel accommodation is provided and you will have the evening to spend at your leisure. After an early start, you'll visit the microfinance office to learn more about the process of lending through Lendwithcare and then meet some local entrepreneurs to hear first-hand how they have used the loans they've received. After lunch you'll return to Siem Reap to catch an evening flight to Heathrow, London. People from all walks of life will be taking part. Most of the time participants will sign up as an individuals, but groups of friends, colleagues and couples will often choose to take part together as well. Whether you are an individual or part of a group, by the time you have completed the trip you will have made friendships that will last a lifetime. The event is challenging so it is important that you train, although with the right training anyone can complete this challenge. The fitter you are the more you will enjoy your adventure. Once you have signed up we will send you a training guide that will allow you to reach a suitable level of fitness. What’s a typical day on the ride like? Whilst we are biking we will be up at around 6:30am. After an early breakfast buffet we will normally start biking around 8:00am. We will cycle for around 3-4hrs, stopping on average every 15-20km (every hour/hour and a half) for snacks and drinks. Lunch will normally be cooked in a local town restaurant and there will be plenty of dishes to choose from. On arrival at the next night’s accommodation, you will be allocated a room and have the opportunity for a shower and well-earned rest. Dinner will either be in the hotel or a local restaurant and there will also be a short briefing each night about the next day’s ride. What do I have to spend additional money on? Before: Vaccinations, a tourist visa, and any kit required that you don’t currently have. During: All meals and accommodation are paid for but you will need money for drinks in the evening and personal shopping during free time. Do I need any specialist kit or pro cycle gear? No, except for a good quality cycling helmet – this one is non-negotiable. However, it is advised to get padded shorts (usually lycra) – you can wear these under some comfortable clothes if you wish. We would advise you wear breathable/wick away fabrics as the hot and humid weather will make cotton based clothes uncomfortable. A full suggested Kit List will be sent when you register for the event. Everyone will need to organise and take out their own comprehensive travel insurance covering health, accident and loss before departure. You will need to provide confirmation of your insurance to the CARE Events Team by 18 June 2019 – this is the same date that 80% of your total fundraising target will be due. Can I extend my trip or book flights from a different airport? Yes you can. If you want to arrange your own flights you can pay for them yourself and we will reduce your minimum sponsorship to £2,700 reflecting this change. Alternatively we can book different flights for you to extend your trip on either side, although we would always recommend staying on after the trip rather than going out earlier. There will be a £50 administration charge and you will be required to pay the difference if the flights are a higher cost. Food will be top notch and there will be plenty of it! During rest stops we’ll be providing dried and fresh fruit, chocolate bars, crisps, nuts, fizzy drinks and water. Basically everything you’ll need to provide you with energy throughout the day. Lunch and dinner stops will offer local cuisine with both meat and veggie options, and lots of rice. Plenty of dishes will be on offer for you to choose from, which will usually be shared across the table. Specific dietary requirements can be specified in the registration form, and we’ll ensure that these are catered for on the trip. Room allocation is done firstly by preference – have you asked to share with anyone? This might be a friend you are coming with or someone from the group you have met before the trip on got to know on our Facebook group for the event. If you haven’t requested anyone we will pair you based on gender and age – we will never mix genders and we will also be able to swap you during the trip if there are any problems. If you would like your own room for the majority of the trip, we can arrange this with a single room supplement of $250 (US). This will secure you your own room for every night of the trip apart from on board the junk boat on day 3. What is the registration fee? How much do I have to fundraise? When does my money need to be raised by? You will need to have banked 80% of your fundraising target (that’s £2,640) by 18 June 2019. If you need a bit more time you can make a personal payment which can be refunded once your fundraising has been completed after the trip. Unfortunately we can’t offer any flexibility around the 18 June deadline, as this will be when we pay for your costs on the trip. I’ve never fundraised before, how do I start? A great way to start fundraising is to set up an online sponsorship page at Just Giving which you can send to everyone you can think of: workmates, clients, friends, family… you name it! Many fundraisers will also organise events such as dress down days, quiz nights, five–a–side football tournaments, golf days, car washing, cake bakes… which have all proved to be successful and great fun! There are many ways to raise funds and when you’ve signed up we’ll give you a Fundraising Guide and be happy to support with ideas as well. We’ll send you our Fundraising Guide, full of tips to help you reach your target and you’ll have a dedicated member of the CARE Events Team who you can talk through your ideas with and give you advice, whenever you need it. How much of my fundraising does care receive? To take part you need to pay a registration fee of £250 and raise £3,300. The costs of the trip, which are approximately £1,650, will come out of the total fundraising target. Therefore, a minimum of £1,650 will go to CARE’s poverty fighting work. Will people think they’re sponsoring me to go on a holiday? This challenge is tough, for many reasons. Some people find being far from home in a new country as tough as the cycling itself, a challenging 450km over 6 days, and we can guarantee that although you will have an amazing time, it will not be your average holiday! It is also common for people taking part to contribute personally to the costs themselves which ensures all fundraising goes to CARE. Whilst this isn’t always possible, if this is something you want to do you could consider making a donation monthly onto your online sponsorship page towards your costs. Your funds will support CARE International. 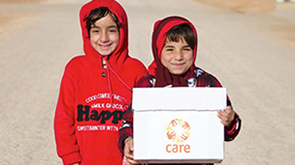 CARE is one of the world’s top aid agencies, fighting poverty and injustice in over 70 countries around the world and helping vulnerable people to find routes out of poverty. We deliver long term programmes to fight poverty, and are always among the first to respond to emergencies. We can’t do any of our life saving work without the support of people like you. Download a Registration Form, or request one from the CARE events team by email or on 020 7091 6111. If you have any other questions, please don’t hesitate to contact us on 020 7091 6111 or send us an email at events@careinternational.org.